Tris2-chloropropyl phosphate production process - ZhangJia Gang YaRui Chemical Co., Ltd.
(1) to three phosphorus oxychloride and epichlorohydrin by phosphoric acid, three in catalysis of AlCl3 (2, 3- two Lv Bingji) ester mixture. (2) added to the mixed solutions of alkali, alkali washing to neutral, static stratified, removing water; reservoir water again after the static stratified, removing water, reservoir after distillation liquid phosphoric acid three (2, 3- two Lv Bingji) ester, and the nitrogen gas purification. This process has the advantages of simple preparation process, to produce phosphoric acid three (2, 3- two Lv Bingji) ester as compared with the existing production process of high purity, its quality detection results were better than the existing technology in the production process to produce phosphoric acid three (2, 3- two chloropropyl) ester. 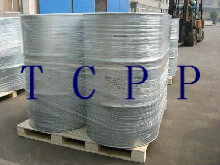 Process the above description of the product, such as the flame retardant TCPP production technology to further understand please contact us. If Tris2-chloropropyl phosphate production process product is not what you want, we can be customized according to your needs, please send us your order to Email: sales@yaruichem.com , or click here to post your buying lead.